This new, cozy hotel in Bouillon, Belgium offers guests a unique location and setting inside the watermill of the old castle in the medieval Ardennes. First-class services and accommodations await travelers at this quaint Bouillon hotel in the Ardennes region of Belgium. 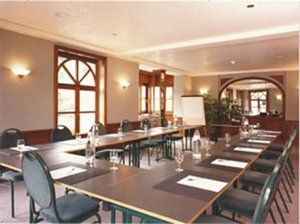 The Best Western La Porte De France is situated near the Castel of Bouillon, the Archeoscope museum and the Semois River. Travelers especially enjoy staying at the La Porte De France exploring the historical sights of Bouillon. This Bouillon hotel offers guests a complimentary full breakfast and a multi-lingual staff to assist with any guest needs. Other hotel amenities include free parking, a tavern and terrace with views of the Semois River. Experience the unique and welcoming environment at this Bouillon hotel. Make an online reservation today at the Best Western La Porte De France hotel. On premise: * Brasserie, a Paris style restaurant serving international cuisine, open daily from 7:00 a.m. to 10:00 p.m. * Gastronomic Restaurant, serving international cuisine,open daily from 7:00 a.m. to 10:00 p.m.